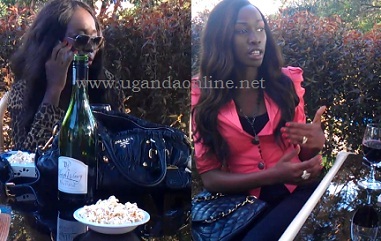 Now this is war between top socialites Zari Hassan and the Fab Clan (Sue Ochola and JH). On Saturday at about 5:00am hell broke loose after Ivan was told that Zari was in the women washroom talking to Sue Ochola. The Fab Clan members have given their side of the story. Apparently the gals were chatting on who should use the mirror first when Ivan stormed from nowhere into the women washroom and started beating up Zari. Ivan ordered his bouncers to drag Sue Ochola and all her friends out of the washroom and eventually Club Silk. Sue Ochola was pushed to the floor before being dragged out by Ivan's bouncers. It's not clear where Club Silk's bouncers were while the Fab Clan members were being dragged out and worse still how a man can walk into the ladies washroom and start beating up someone even if one is a wife. Judith Heard who is very close to Sue said that this has to stop. Why is it that every time Zari is in the country one of her friends has to be attacked. Judith Heard who says that from the time she failed to attend the Zari White Party, the two former friends have not been on good terms. Sue and Judith maintain that Ivan thumped Zari as Sue was watching but because Sue had spotted them, they rushed to the media saying it was Sue who was thumped. On the other hand Zari maintains the Fab Clan guys are just cooking up stories: "Tell the lies, the truth remains. My hubby isn't wat ur putting out there. Am glad he did u justice!" Zari's post on this developing story read. Zari will be having her The Zari Boss Lady press conference tomorrow at Golf Course Hotel and she will certainly shed some light on this.